Equally as important, there must be opportunity to regularly reflect on the original initiative as well as on the ongoing process. At this point, it may therefore be helpful to take up the approach used in Phase 1 again to clarify the context fully, extend capacity building, integrate new stakeholders into the process or introducing additional agreed upon rules and legal guidelines. Here is how the 4C project, a cross-sector partnership between coffee traders, producer organizations and international civil society organizations that aims at improving conditions for all participants of the coffee value chain, mastered its implementation phase. One of the main features that flanked implementation was finalizing the “Rules of Participation” for Trade and Industry. It laid down the rules for trade and industry to participate in the implementation of the project and it also changed the attitude of producers towards corporations and persuaded them that companies were concerned and willing to cooperate. This agreement was a major factor for the success of the initiative, because it ensured that the interests of producers would be taken into consideration through a sustained market access process and industry contribution to capacity building. Reaching this agreement was a difficult task, and had been interrupted by several rounds of consultations with Lawyers on Anti-Trust regulations. The final goal of the phase for the 4C project was to make the initiative as such sustainable, and create a self-financing system. Therefore the phase between 2004 and 2006 concentrated on ‘how to make to Code of Conduct work’, the process of setting up, preparing the system of verification in consensus with all stakeholders, and the support platform to enable the Code of Conduct to be implemented. Until that stage the code was a mere piece of paper which had high potential to stimulate sustainability in the coffee sector. 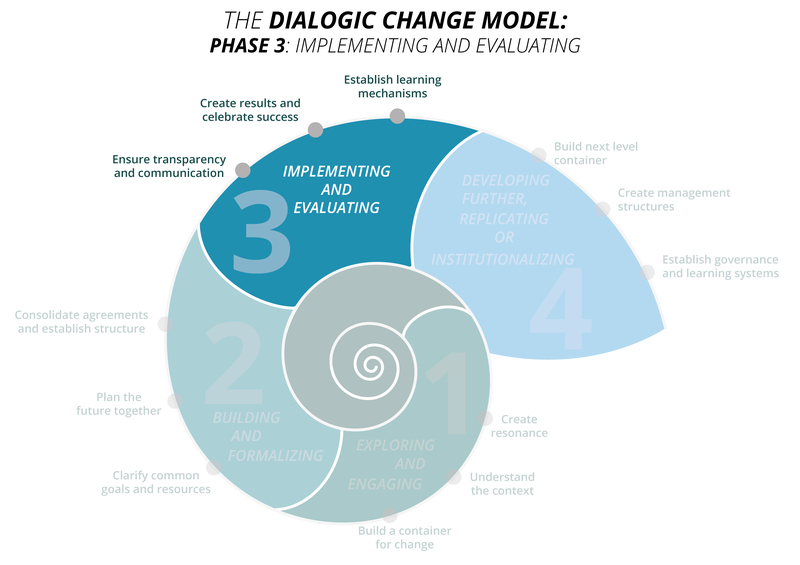 To find out if your change initiative has considered the most important aspects of Phase 3 I invite you to have a look at our online tool for phase 3 – giving you the possibility to assess your progress and get recommendations on what are important steps you and your team can take to successfully navigate through the implementation phase of your project.